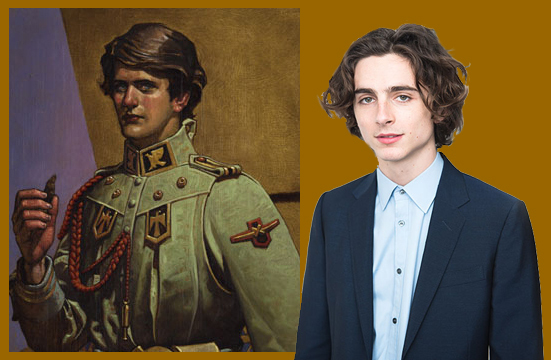 Will Timothee Chalamet play Paul Maud'Dib Atreides in Denis Villeneuve's DUNE? Hey folks... the drums are beating loudly tonight to pass on this news, which is actually nothing definite... but THE HOLLYWOOD REPORTER is reporting that Timothée Chalamet (CALL ME BY YOUR NAME, LADY BIRD) is in negotiations for the part of Paul Atreides in Denis Villeneuve's two-film adaptation of DUNE. The SICARIO/ARRIVAL/BLADE RUNNER 2049 director is working from an Eric Roth (THE CURIOUS CASE OF BENJAMIN BUTTON) script. Chalamet is about the right age and size for the young Paul-- maybe not as well-built as a young Kyle MacLachlan, but believable as a Duke's son... and able to grow into the role in the years it will take to film. Read The Hollywood Reporter's take on matters here!